Crótalo Plata or Silver Tequila is triple distilled and rests for 45 days in French oak barrels that have been sealed by the CRT (Consejo Regulador del Tequila) using our proprietary aging process. It retains the natural sweetness of the agave while being influenced by nuances of the oak barrels it is rested in. Crótalo Plata is as versatile as a top shelf Vodka and is excellent for sipping, shooters and mixed drinks. I had heard a lot about this brand, so was very interested to try it. The nose was weak, no agave, slight chemical smell. The taste turned slightly sweet, but more chemical, with a touch of citrus rind. The body was the best part for me, being oily and chewy with a great mouth feel. The finish was short, unremarkable, with some vegetal elements lingering. This was not bad a tequila or a bad experience, but it was nothing special. There are others I'd rather have for the premium price that this sells for. A nice bottle, unique shape. 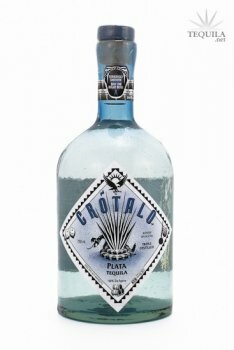 Crotalo is a fairly new kid on the block, but has created quite a following with a number of awards. I've had the Extra Anejo and the Reposado...and was looking forward to trying the base of the entire line. Aroma: A great nose of sweet agave, light pepper and a hint of vanilla and citrus. Initial Taste: Sweet agave entry (maybe with hint of vanilla) with nice notes of spice and pepper. Body: A wonderful semi-oily medium body that compliments all of the flavors well. It's got great blanco flavors foremost, but nice light complimentary spice notes. It's a little different with every sip. Finish: A very smooth finish with just a slight alcohol heat. Great spicy ending with a nice true agave flavor. Crotalo really did this one right and it shows with their entire line. It's got a premium price, but sometimes it's worth it to pay for something really good. This rivals the very best blancos that I've had. Well done Crotalo!